The LE uses two different sound types: Audio and sound effects. The audio files are located in the TRLE/Audio folder and they are in *.wav format. The audio files are basically background music, like background ambience, thrill music, mysterious music and of course the well known secret tune. The files are numbered 000 to 111. You can replace existing files with new ones or you can add files. TRLE only came with a couple of audiotracks, but the LE won't accept files with numbers higher than 111! Microsoft ADPCM 44.100 kHz, 4 Bit, Stereo format and save. They should work now. The audio files need to be activated with a trigger. 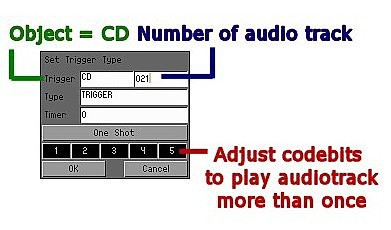 Open the trigger type window and choose CD in the trigger box. Put in the number of the audio file you want to be triggered in the box next to it. Audio files can only be played once in a level. Exceptions are 005.wav (secret tune) and the background audio loops. Unless... you change the codebits of the trigger. You can trigger an audio track to play up to six times when you adjust the codebits of the first trigger for that particular audio track. 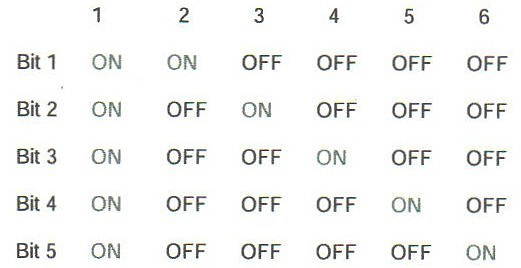 The below images shows you how to set the codebits. The image is taken from the manual.